This year World War II is going to get a lot of attention. May 8, 1945 was be the 70th Anniversary of the end of World War II in Europe. But thinking about World War II also makes remember the often forgotten war. … ever heard of it? Yeah, I hadn’t really either. Beyond hearing about a For Whom the Bell Tolls by Ernest Hemingway , I didn’t understand the time period or the events of this war. When I was researching for my World War II novel, Arms of Deliverance, one of the autobiographies I read was from a man who was a B-17 bomber pilot over Europe — but before that he was an American volunteer for The Spanish Civil War. I had never heard of this war before so I started researching, and I was soon fascinated. Some people call it “the first battle of World War II” because it’s where the Nazis first tried their hand at modern warfare. What was The Spanish Civil War about? Ordinary people tried to take over the country from the Spanish (fascist) Government and military, and people around the world came to help them fight. Other European countries also got involved. Most of them sided with the fascist Spanish Government. In fact, Germany jumped into the fight and German pilots bombed Madrid after the people took over the city. German bombs fell in Spain long before they hit the French or English soil. As I started by researching this time in history, unique characters who had an impact started to form in my mind. For this series, I dove into the lives of an American artist, a few international volunteers, a Basque priest, and a German pilot. I researched the real people first, and then the plot for my novel built around them. The most difficult part about writing about The Spanish Civil War was dealing with the political climates of that time. One of my characters, Deion, is African American and he is part of the Communist party. Today’s reader has a different view of what that means than people in the 1930 did. In the 1930s, many people found hope in Communism. In a country that was still segregated, the idea of “equality of men” was a huge draw, especially for African Americans. Even though the political climate was hard to grasp at times, I really liked researching the Spanish culture. Bullfights and flamenco dancing both found their way into these books! My characters surprised me the most thought. In fact, at the beginning of A Valley of Betrayal, I added a minor character because my protagonist, Sophie, needed a ride across the border into Spain. As it turns out her driver ended up being one of the major players in this series. Who knew? This series was very challenging because I knew nothing about The Spanish Civil War before I started. Yet, I felt sure that God was leading me to write these books. I felt Him asking me to take a leap of faith, and during the writing process God (again) taught me to trust Him. When God gives me an idea for a novel it is so BIG. I mean there is so much to pull together. Yet, God has shown me time and time again that He is faithful. He gives me ideas, leads me to the right research books, and even brings people into my life to help me! While I was researching this book, I was having trouble finding out about the German pilots who bombed Madrid, mostly because they did so in secret. During that time, a man named Norm Goyer contacted me because he was working on his family tree. He was a sweet old guy in his 80s, and he wanted to know if we were related. It turns out, we weren’t related, but Norm ended up being an airplane expert and consultant for movies! In fact, he’d actually flown the very planes that I needed to write about! Norm ended up helping me research my German pilot in Spain. What an awesome gift from God! This showed me that whatever God brings before me, He also has the power to help me succeed. It’s been eight years since A Valley of Betrayal released, but I still find myself sharing the stories about this forgotten war over and over again. I also share the story about Norm, and how God proved himself to me. I mean, come on, I could have easily ignored an inquiry about my genealogy … since I was in the middle of writing a very complicated novel! Yes, I learned about The Spanish Civil War as I wrote, but I also learned to trust God more. God provided Norm just when I needed him. And now every time I struggle with finding just the right research I remember when God showed up. He always shows up in this book writing business. 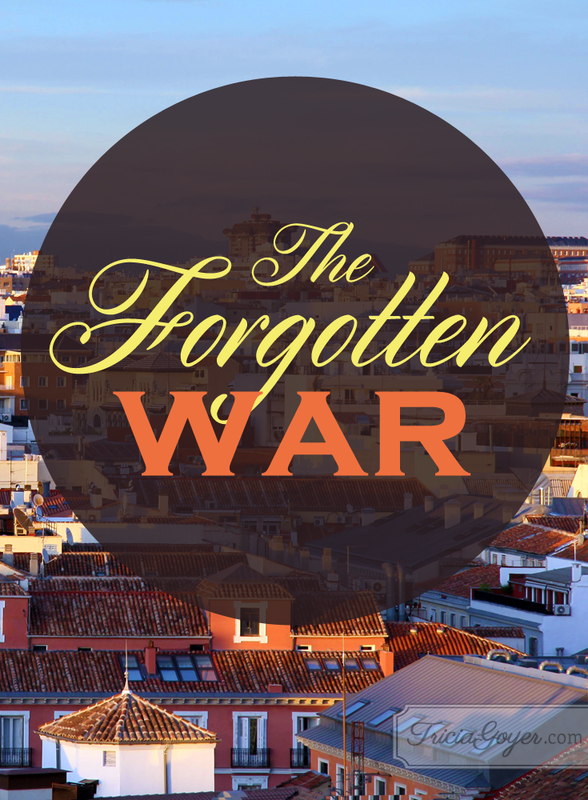 Today, I want to urge you to tell one person about this “forgotten war.” How cool that you now know a piece of history that most people don’t! Also, take time to share with someone a personal story of a time God answered one of your prayers in an amazing way. You’ll never know how it’ll encourage them! Finally, consider picking up A Valley of Betrayal. It’s fun for me to know that I’m bringing history to life for readers. While most of the country has no idea what this war was about, my readers not only know but they can also see God’s hand in history in ways that would otherwise be forgotten. How about you? What’s your favorite historical time period to read about in a novel? Also, when was a time that God showed up to you in an unexpected way? Read the original post at Inspired By Life and Fiction. I enjoy reading novels about the Civil War and WW11 . This is very interesting to me.